Two festivals back-to-back--one in Tennessee, and one in Florida, have just about laid me flat. I breathed something in on the germ tube to Tennessee, and it hit me the Saturday of that festival, and by gum it's still here, 12 days later. Sick as a dog in Florida, but managed to muster enough voice to give a talk and sing a two-hour gig with the Rain Crows. One thing I'll say, being that sick and having to soldier through makes one re-examine one's priorities. I've got one more year of total craziness coming up, with a couple of dozen festivals and talks, and then, by God, I'm gonna stay home and do my real work. I've been slathering myself in Vick's Vapo-rub, sucking on Fisherman's Friend lozenges, and going to bed at 8:30 every night. Tell the coroner when they find me to check for menthol overdose. With few exceptions, all I really want when I'm away is to come back home. I think about my neighbors and friends and know they're missing me. Buffy definitely misses me when I'm gone. She looks pretty good this winter! She's easily 9 or 10, but her weepy left eye looks a lot better than usual, and she's keeping the weight on. Proud of her. I never see Buffy without Ellen's daughter Flag. I love seeing them together, love believing Buffy adopted Flag and Pinky when Ellen was murdered. And I wonder where Pinky might be keeping himself. Haven't seen him since fall, but I'll know him when I see him. 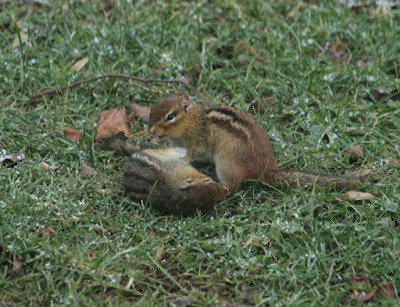 Weirdest thing: my chipmunks have stopped hibernating. They're here every day, no matter the weather. 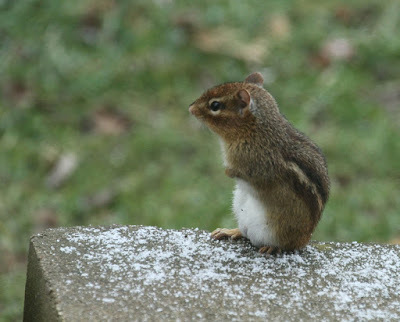 You'd think they'd crawl into a well-lined burrow and sleep away the single digits, but no. What is with that? Anyone else noticing chipmunk activity year-round? O Powers that Be, what does this mean? The males are fighting a lot these days, which I always find amusing to photograph. Whoop! 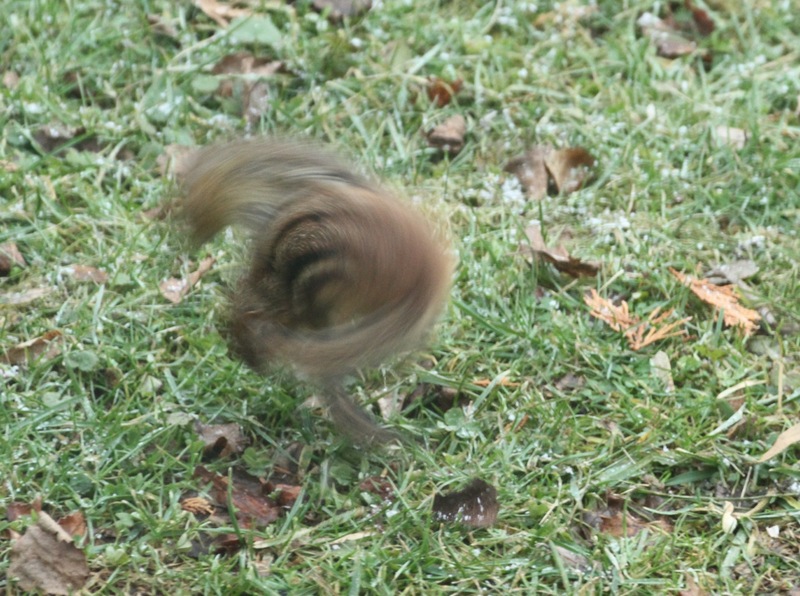 that's two chipmunks in a pancake and syrup blur of motion. I'm thinking of the tiger running around the base of the tree until he turned into syrup in the problematically titled story Little Black Sambo, an 1899 vintage kids' book still popular when I was young. Dating myself, much? Man. I'm older than dirt. This happens when you blog for 13 years. In case I had any doubt as to their gender, I figured it out when they took a breather...mighty fine pair there, sir. 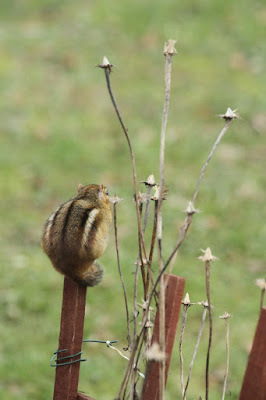 I really dig photographing chipmunks. They're always up to something. 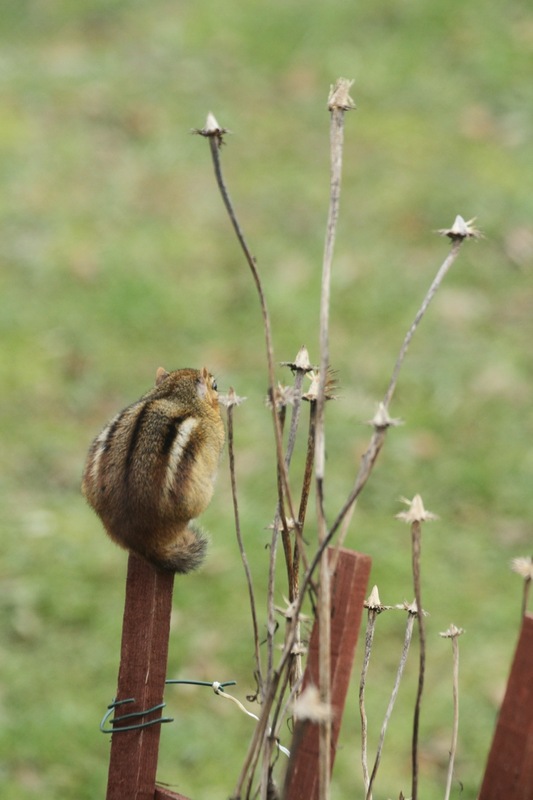 And one really nice thing about them is that when they strike a pose, they tend to hold it for minutes on end. That's hard to find in a mammal. 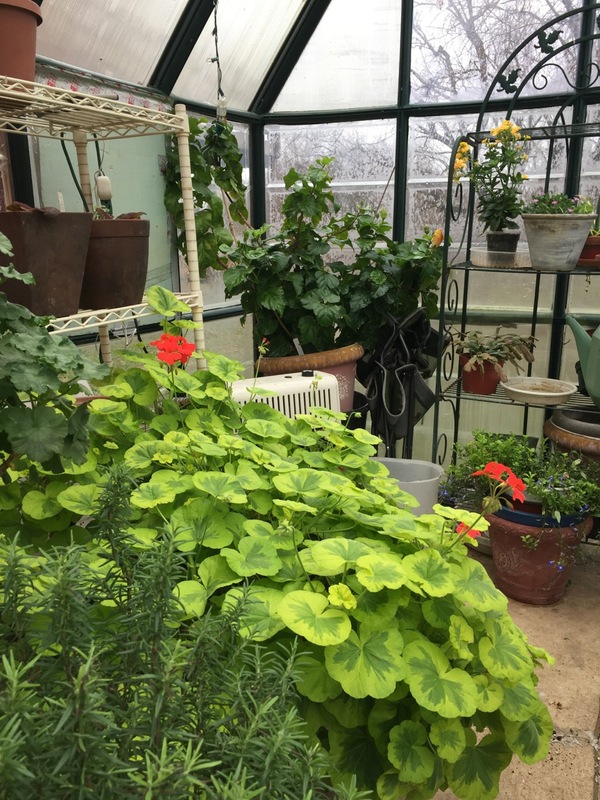 In other news from Indigo Hill, the greenhouse is beginning to show signs of life. Toughest winter yet for my plants. 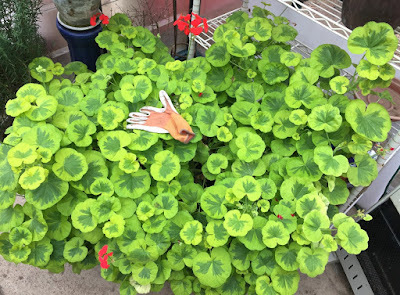 Most of my beloved geraniums have a black stem rot that is killing them off, and they're dropping like flies. I suspect it's fungal, or perhaps bacterial, and it seems there's nothing I can do about it. It just keeps spreading. 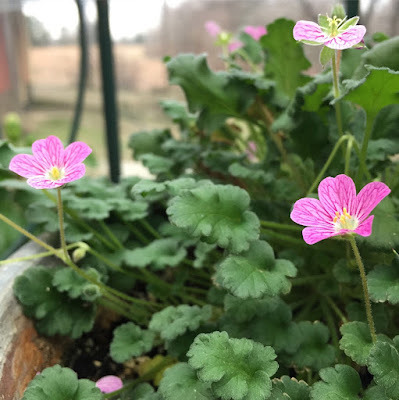 This little alpine geranium, Erodium reichardii from Cyprus and Corsica, is a welcome exception. As in: Not croaking. We like that! The other geranium that isn't croaking is "Happy Thought Red." Great Scott, what a plant it is!! I took this photo today, with my glove for scale. Yep, she's 5' across and going for 6. Here's to plants that aren't dying. I'm so glad this one is prospering. I've taken a bunch of cuttings just in case. If you're going to be overtaken by a geranium, this is a goodun' to be overtaken by. I adore this plant. Its velvety lime leaves, splotched emerald; its brilliant scarlet-cerise flowers. What's not to love? 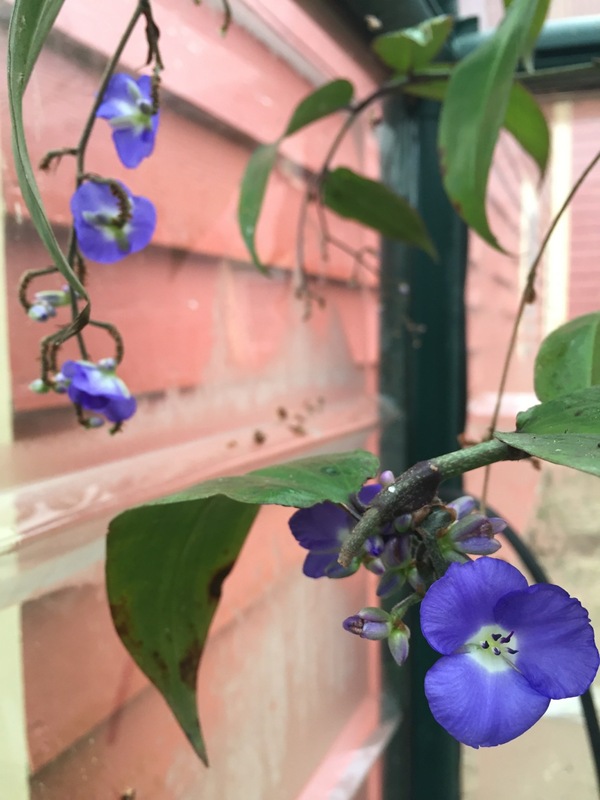 There are other plants to love, like this "Weeping Blue Ginger" that's actually a spiderwort, Dichorisandra. Speaking of letting go, I haven't seen Jemima since Christmas Eve. I've no idea where she's gone. 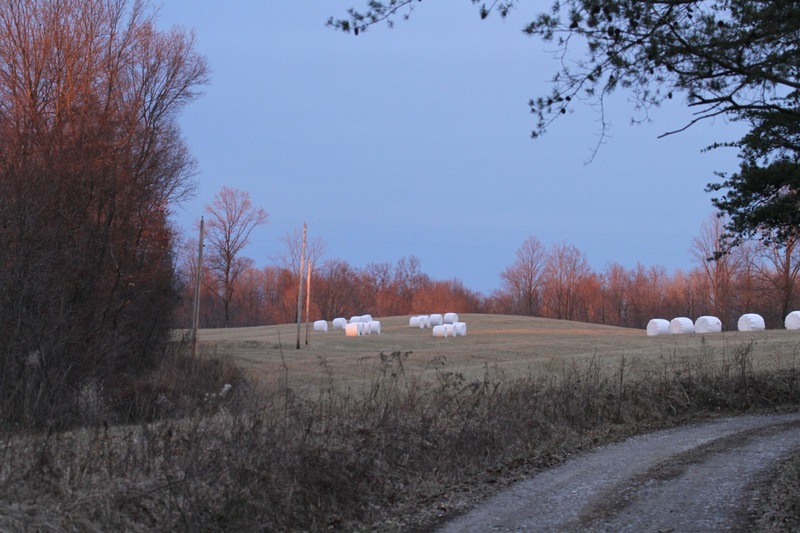 A big flock of 13 swept in right around Christmas, when the severe cold came in, and they stayed until the cold broke. It seemed they replaced Jem's clan, which disappeared altogether. 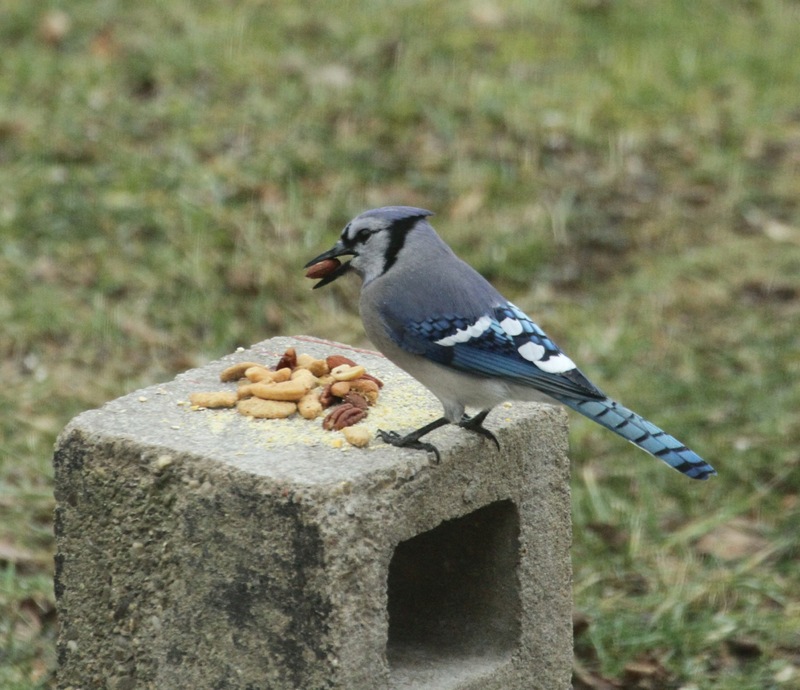 Now I've got seven jays in the yard, and I don't recognize them. Sometimes I think I'm seeing Maybelline and Darko, but I just can't be sure. My frame of reference is gone. I sure am not seeing my Jemima. Even though I put out the good stuff every day. Jay stuff. The letting go was incredibly difficult. Having Phoebe home for a month really helped with that, gave me some perspective and welcome diversion, someone else to love and care and hope for. I am given to obsessing, and I still look carefully at every blue jay I see, hoping one will turn out to be Jem or one of her clan. I've made progress though; I don't watch and hope all day long now. No, I just watch. 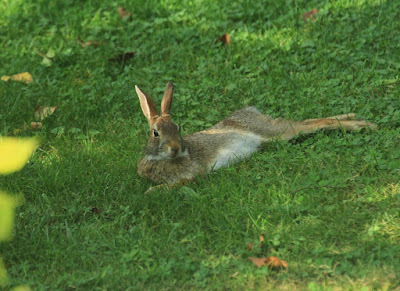 I lost my favorite rabbit Notch last summer, probably to Cindy the bobcat. 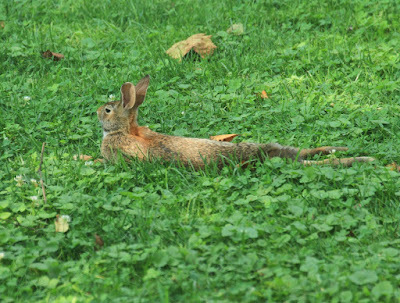 I then fell in love with a rabbit I named Red, a languid, lanky animal who lounged around artistically in the heat. 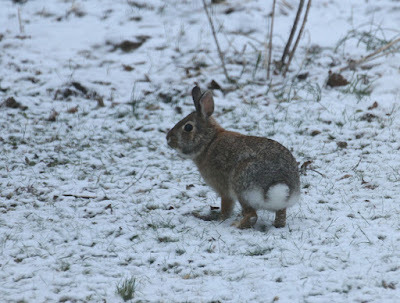 I'm now trying to figure out if the rabbit I've been calling Julie Fatbottom could be Red, disguised in winter fur. Her ears look too short to be Red's. But maybe it's because her fur is so thick? They share a wide thin white collar...I just can't be sure. The only other thing Red and Julie seem to share is a deep red blaze between the shoulders. 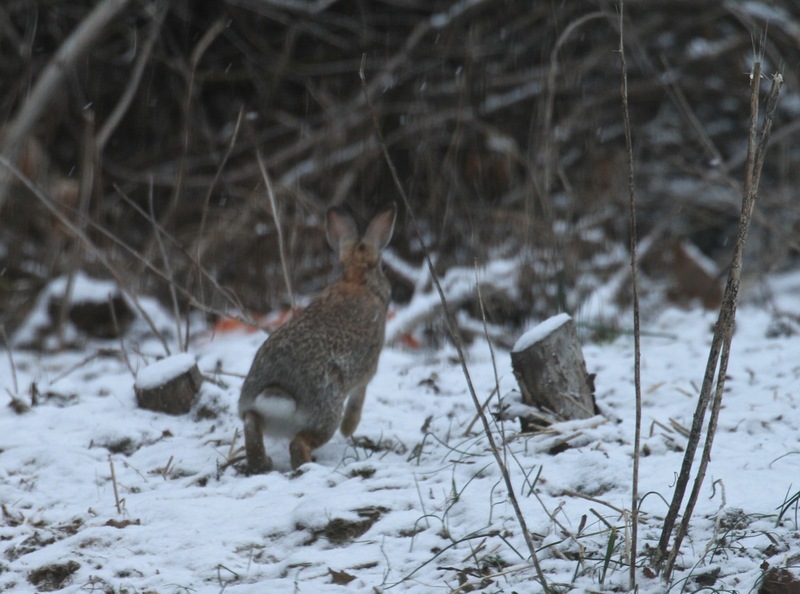 Maybe with spring and thinner fur, the mystery will be revealed. Maybe Julie Fatbottom is really Red. It doesn't really matter who the rabbit is, I know. But I reach, again and again, for these connections, this continuity, with the wild things around me. It keeps me going, keeps me hopeful. It gets pretty lonely out here. 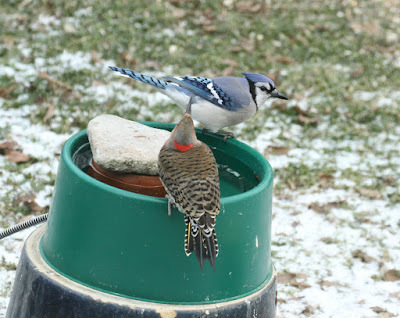 My heated dog dish birdbath crapped out on me in the middle of the coldest period. I called every feed store and hardware in the area, and finally had to drive 1.5 hr. to Athens to get another because they were all backordered. I get such a kick out of this simple device. I understand from retailers that they rarely last two years. If there's anything I dislike it's built-in obsolescence, and having to throw out a perfectly good looking dish that no longer works. Ugh! But I'm hooked on the birds who are hooked on it. 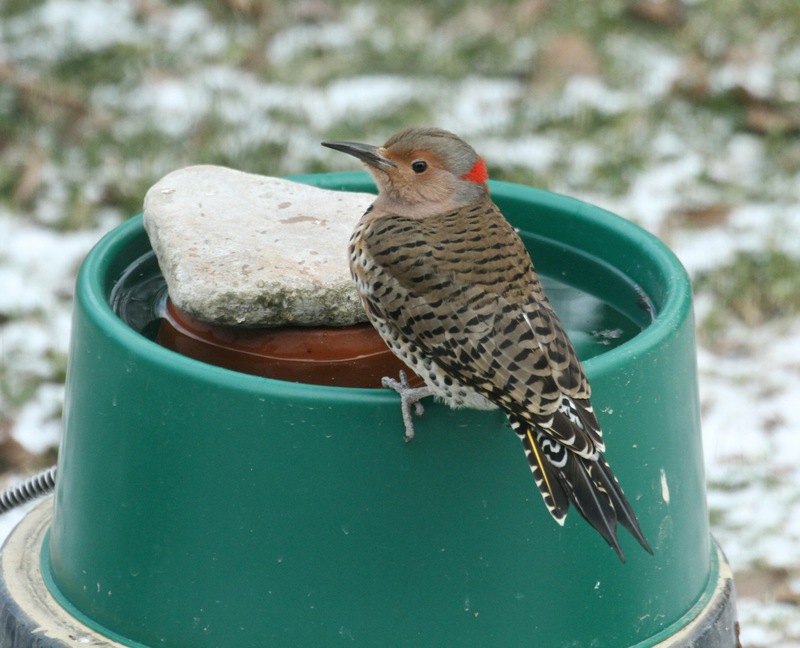 I think that the female flicker who uses it may be the same one who visited the year I first acquired mine. 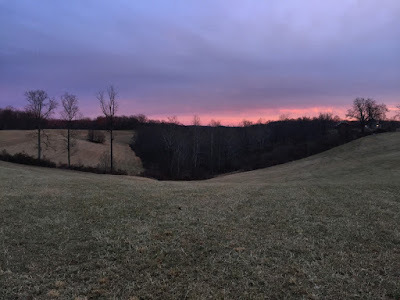 This photo was taken Dec. 8, 2014. This little gal, to my great delight, was one of my first customers at the heated dish! And lo and behold, here's a female flicker looking very much like her on Jan. 31, 2018. Coinkydink? I think not. 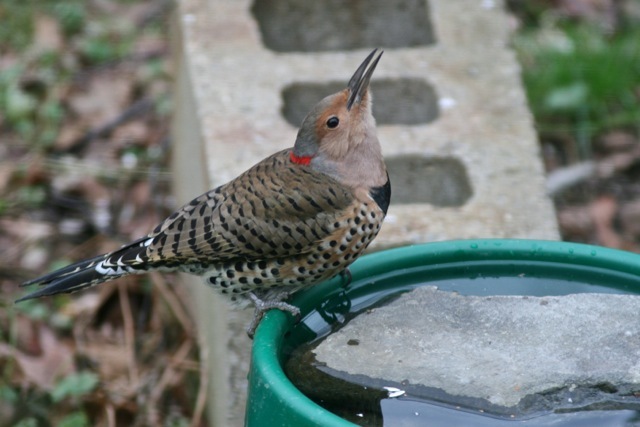 Flickers aren't that common around here in winter, and female flickers who visit heated dog dish baths are an even smaller subset. Grasping for a thread of connection, again. I grasp with joy. And while I was photographing her yesterday, wondering if she might have been visiting the yard for four years, a drop-dead gorgeous jay landed on the bowl beside her. WOW. What's gonna happen now? 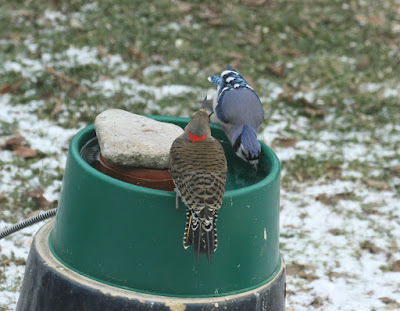 I can tell you, if that were a red-bellied woodpecker, there'd have been a rumble! But she didn't bat an eye. 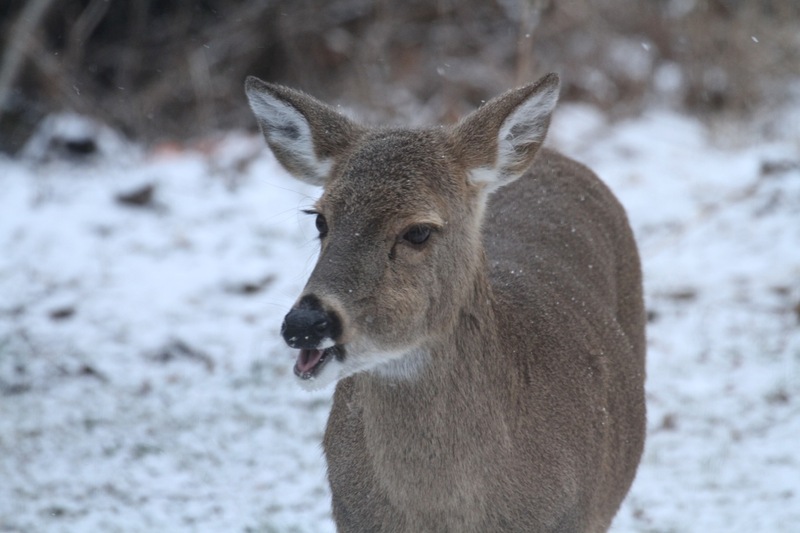 She regarded the jay calmly. Dipped for another drink. There's room here for both of us, she seemed to say. And my heart swelled like to burst when the jay dipped its head and drank, too. Little matter that the flicker could have put its eye out with one quick strike from that scimitar bill. The jay seemed to know she wouldn't. Ahh, birds and little plug-in dog dishes. They bring me such joy. So the winter days roll by, and I work and cough and cough and work. I've just put the finishing touches on a slideshow about the Vienna snowy owl. I never dreamt I'd be working on it for weeks, but I have been. When all was gathered together, I had 15,000 words and 160 images to sort through. I realized that, over the past month, I've written a book on that owl. I know why I did it. It's because Jemima left. I needed another focus. Gathering his story together and tying it all up with a bow has been a deeply absorbing pursuit, one I'm grateful to have had. I'll present it Tuesday, February 6, at 6:30 pm in Athens, Ohio. Maybe I'll see you there. Until then, grab that last light of day. Get out there. This evening marks Imbolc, an ancient pagan holiday that celebrates the midpoint of winter and the turning toward spring. I learned that from my friend Gale on Instagram. And I am ON IT. Listening for the woodcock, grabbing at those connections. Half way through it! Winter is a challenge that makes Spring so sweet. So many folks have one crud or another; and influenza is all around us. Early to bed and taking it a bit easy might be wise. Letting thy body heal itself. You had DIRT when you were a kid?! Wow. You must have been rich. 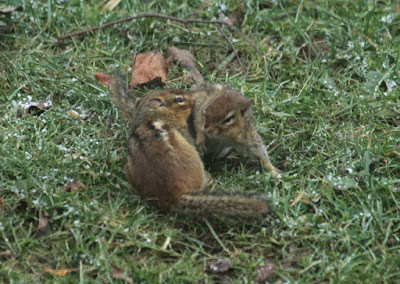 Our chipmunks have been active for about 3 weeks along with 7 squirrels, 1 opossum and a young raccoon. Up to 11 deer come in and clean up under the feeders. I remember Little Black Sambo. And how Sambo was a little Indian boy, and the tiger ran around the pole so fast it turned into butter. Am I remembering wrong? And how the Sambo's restaurant chain had pictures of the little kid in a turban and maybe pointy shoes, and the tigers. And how because it was Li'l Black Sambo it was assumed it was about a little African American boy. And boycotts ensued. And people named their black dogs Sambo. And everything got balled up and yet did not turn into butter. I do believe I'm rambling. Carry on. 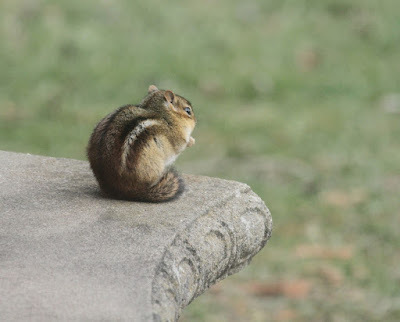 I too appreciate chipmunks for their willingness to be photographed. Butter. Yes. Churned whirly tiger butter. Don't know why I remembered pancakes and syrup. It was something edible, that I remembered. One of those scratch your head children's book moments. They all have to make much more sense now and be proper at all costs. Which is in part why I write about birds and chipmunks. Nothing has to be made up or tarted up. It's just reporting. Anyway, so great that you have a book-length saga on Mr. Snowy to pass along, so his story will continue on. I'm also older than dirt and remember that book - even remember my Mom reading it to me in the kitchen! I love your posts. I live in a large (for New Hampshire) city, so there isn't a lot of wildlife - we know there is a skunk at the end of the alley 'cause we smell him occasionally, and twice I've come out of the driveway onto the main street to see a MOOSE! They come down from Mt. Uncanoonuc to visit. So I live vicariously through your blog to enjoy the flora and fauna. Thank you for all your stories and information! Publish that book about the Snowy Owl! Great story! So glad you shared it with us on your blog. Thank you. Well geez. I had that book, Little Black Sambo, and worked at Sambo's in Tempe. I guess that has to make me older that, well something, since you have proclaimed to be older that dirt. I am so glad to have a 'friend' like you who can recount the story of so may lives so they live on. Love you my friend. (glad I'm not traveling during this flu ridden season. I briefly wondered how much a ticket to Ohio would cost just to see your talk) You got me wondering if all day flowers at spiderwort species. Feel better my friend. If good wishes help you will be better in no time. Love your stories from around home, Julie. 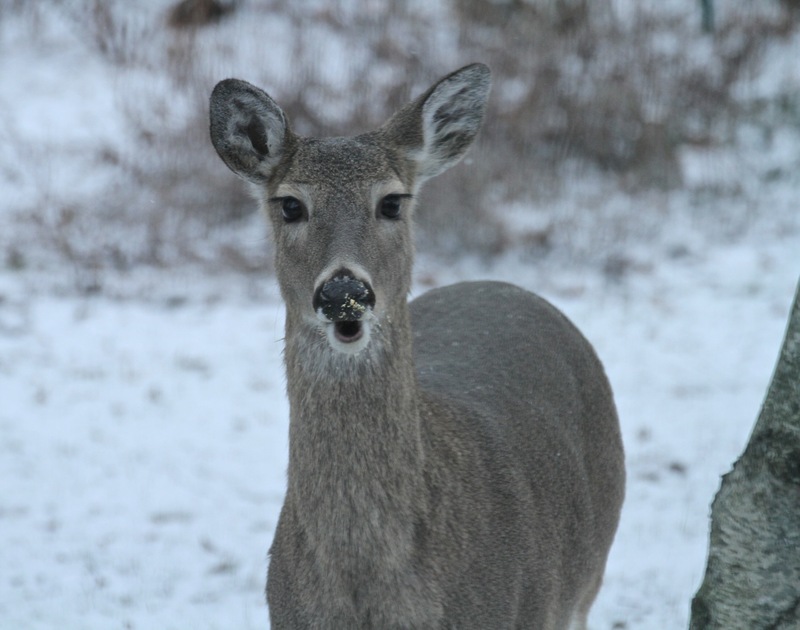 You like to see all the good that's around you in the outdoors as do I. 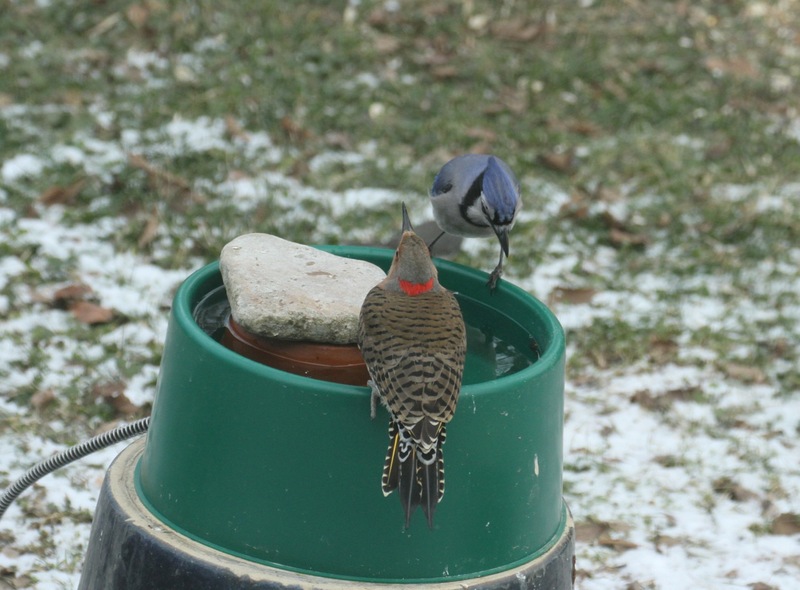 We had some jays and a red-bellied woodpecker visit together recently at our heated birdbath. 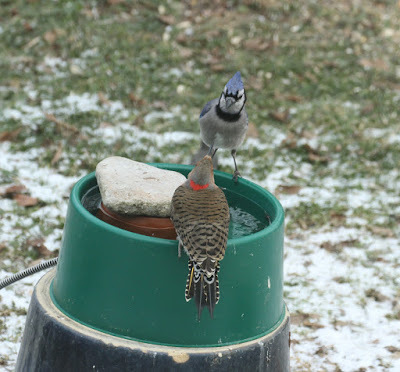 They were convivial for awhile until it got too crowded. My husband took a video which I'll try to send you vie email. So fun to watch them. Hope you are feeling well soon! The robins passing through my yard seem to make an extra amount of noise and stare at the kitchen till I come and break the ice on the pond. As soon as I shut the door they're back. 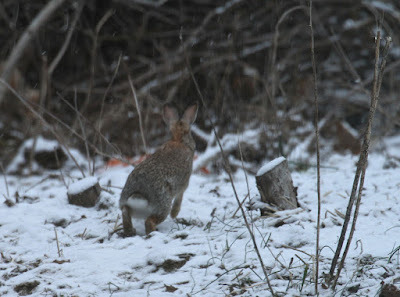 Nice to stumble on your blog, and to see your passion for opening people’s eyes to nature. Long ago as a student you came to my Serengeti Lion slideshow, at Harvard I think, and afterwards you gave me your doodle of African animals that you’d sketched from the photos. It was amazingly good, I still have it somewhere. You signed your unusual name and added “for when I’m famous”. After hearing your delightful talk at Wings of Winter in Tennessee, I decided to find your blog. Sorry to discover that you got a disease. Like birds, bird lovers migrate too much to stay healthy. I really enjoyed reading about your critters. Our chipmunks have been somewhat active, though not so during the single digit spell we had the first couple of weeks in January. We live in the Appalachian foothills as well. This time of year the beautiful softness of the brown beech leaves dominates the understory of the forest. I really like the winter forest more than the summer canopy. I love the stark, cold branches of the chestnut oaks, dark against the gray winter sky. I wanted to ask you at wings if you had written a piece about a beech tree at th back of your place in Bird Watchers Digest several years ago. Someone did, and it got my attention due to our own beech trees. @davidby I remember that talk! How wonderful of you to pop up here. Thank you for your kind words and for igniting a burn about Africa that has translated, many years later, into leading occasional groups to South Africa. Yay for travel, yay for talks, yay for making oneself known. Thank you! Thanks. Sorry it took so long to respond. That was indeed the piece that I recall. Many of our beeches are dying and getting old quicker than I anticipated when we moved to our place in 1993. I have taken to enjoying the tiny beeches that keep their brown leaves all winter. One of my favorite things about winter. As I write the tooth wort is in bloom and is barely deterred from its mad rush to beat the leaves. Hold on Spring is coming, whether you can see it or not.